CAPITOL HILL. Thursday, May 31, 2018— The Irish National Caucus has taken up yet another case of British government collusion in the murder of a Catholic in Northern Ireland. Mr. Gallagher was murdered on March 24, 1993, in Belfast. His grandson Caolan Patrick McAleese emailed Fr. Sean Mc Manus—President of the Capitol Hill-based Irish National Caucus— requesting help in the case of Mr. Gallagher, “murdered in collusion with British state forces.” (Email. May 30, 2018). Fr. 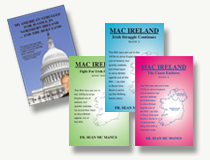 Mc Manus said: “In over 45 years in America, I’ve never turned down a request by victims, Protestant or Catholic, in The North. I have promised Caolan Patrick we will raise the case in the U.S. Congress, using the Report he sent us by Relatives For Justice: The murder of Peter Gallagher: Complaint to the Police Ombudsman by his grandson Caolán McAleese. (Copy attached). The Report, Fr. Mc Manus explained, states:’However, the material we have provided suggests that the apparent lone killer and a number of individuals associated with him may well have been in the pay of one or more secret national security agencies. These shocking possibilities require a properly independent investigation which can reassure the family and the wider public: all relevant information must be put into the public domain, including where agents are involved in criminal activity and where their handlers connive in major human rights violations. Fr. Mc Manus concluded: “This is yet another deeply disturbing case of murderous collusion.